Beef and bacon roll ups - these are genus! Virtually carb free. I posted my beef and bacon roll ups on Instagram a while back and they went absolutely crazy. It was just a recipe I made up one day because I had some beef schnitzel sitting in the fridge that needed cooking, and I just threw these together. It turns out these can be served as a main dish, or as I did, cut them into small pinwheels for lunch boxes. Beef schnitzel is just incredibly thin slices of beef, sometimes tenderised. “Schnitzel” is often confused with thin meat that has been tenderised and coated in egg, flour, breadcrumbs, and fried. But schnitzel actually refers to the meat. The breaded recipe should correctly be named breaded schnitzel. Schnitzel (beef, turkey, veal or pork) is so versatile. It can be served crumbed and fried, sliced in a stir fry or as I discovered, as beef and bacon roll ups. Simply lay the beef schnitzel on a chopping board, layer with bacon, spinach and some cheese of your liking. I wish I had made these with blue cheese. But then again, that may not have survived the lunch box trip to school. If you were to serve these as a main dish for dinner, I would make mushroom sauce and drizzle it all over once cooked. 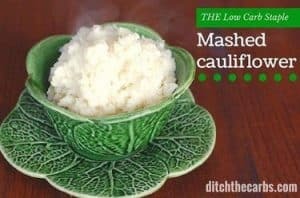 Serve with mashed cauliflower and some more leafy greens (with butter) and you would have an amazing easy family dinner. 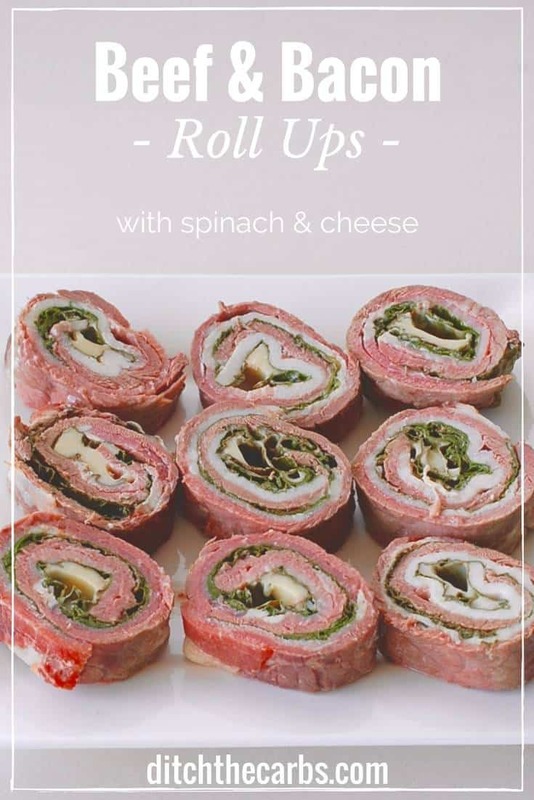 Slice the beef and bacon roll ups and you suddenly have pinwheels for lunch boxes for the next few days. Lunch boxes need to be easy, but they also need to be packed with real food, protein, healthy fats and nutrient dense carbs. I know my kids would rather eat these then a dry sandwich any day (me too). 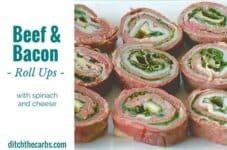 Beef and bacon roll ups are perfect as a whole roll up or sliced into little pinwheels. They are an easy family dinner, or perfect for healthy packed lunch boxes. Lay the beef schnitzel on a chopping board. Place the streaky bacon along the length of the beef. 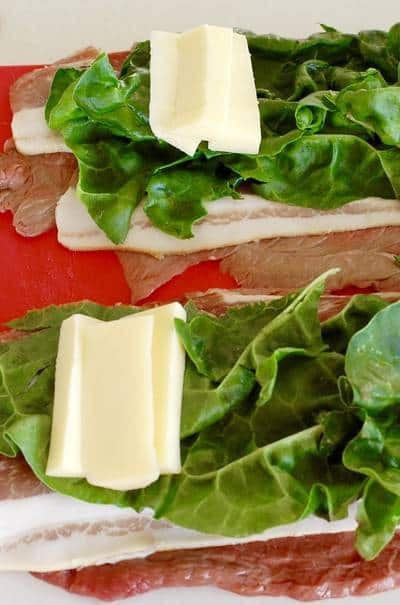 Place some leafy greens on top of the streaky bacon. Add your favourite cheese across the meat. This will become the centre. Roll the beef and the fillings up tightly. Secure with a toothpick if required. 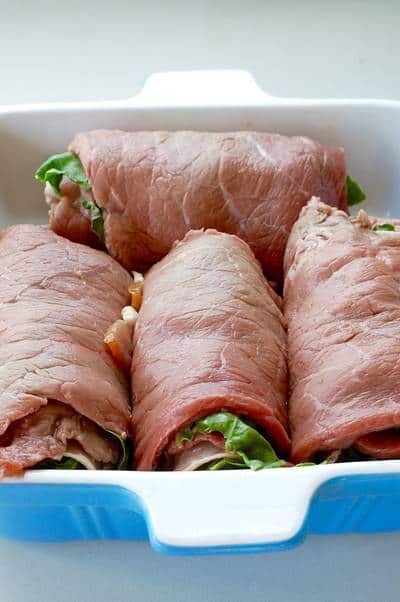 Place each beef and bacon roll up in a baking dish or baking tray. Spray or brush with oil. Cook at 180C/350F for approximately 15 -20 minutes until the beef and bacon are cooked thoroughly. Cooking time will depend on the thickness of your beef and bacon, so may vary widely. Serve hot with mushroom sauce or allow to completely cool, then using a sharp knife, carefully cut into small slices as shown. Nutrition values cannot be given as your beef and bacon will vary in thickness and therefore weight. Needless to say this is pretty much carb free apart from the spinach (1g net carbs per 100g) and cheese (negligible depending on cheese). Nutrition values will also vary according to how thick you cut each beef and bacon roll up. In America near Latin areas, the thin steaks would be called Milanesa (Me-la-nessa). Or thin breakfast steaks. Just seen this recipe! Looks awesome! I am making this to cook over a camp fire while ice fishing next weekend! A little red wine reduction should be perfect for the dip! Or even hot sauce! Or ketchup! I can’t wait to try this!!! 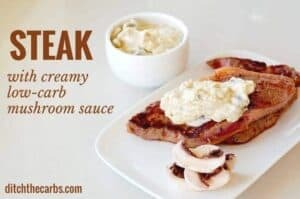 Ok, probably a stupid question but what is “streaky bacon”? Streaky bacon is the stripy belly bacon that is generally thin and the streak of fat runs parallel to the rind. today just after gym, i made it and booommmm such an amazing and yummy dish. thanks a million to share . These are good hot but even better sliced up cold for snacks, lunch etc. Really worth making at least double and having the rest sliced up in the fridge. Is there any recipe on this website that does not contain cheese, bacon, or any other processed meat? 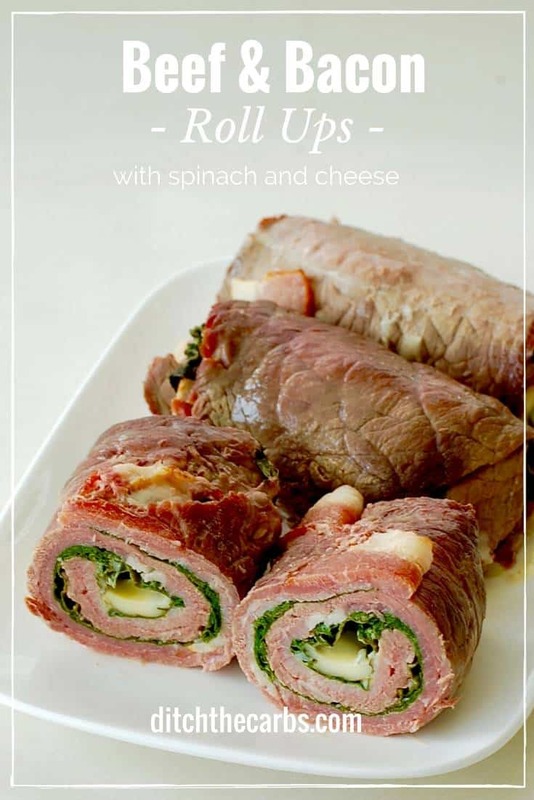 You can rollup just about anything you like in sliced cooked roast beef. If you happen to be of the Vegan persuasion you can use large leafy greens to do the same thing. Use your Imagination. IF come up with one that you Family and Friends like…Please share. Low carb food generally has an excess amount of processed food,…..therefore can be quite high in calories. Very important to keep the portion sizes down also! Lo-carb food is generally fresh veggies and fresh meats. There are always going to be poor ways to eat on every diet plan, but for the most part, lo-carb is pretty natural and back to basics. Do you avoid those foods? There are plenty of healthy options for you in a low-carb lifestyle! You can leave the cheese out, replace it with something similar, or use less/different kinds of cheese. And of course you can leave out the bacon in this recipe, as well as others. If it tastes good and fits your healthy eating plan, we all win! Sounds delicious! Schnitzel is hard to find! Is there another meat I can use as a substitute? Also, what size and texture of bacon should I look for? Thank you! Can’t wait to try it! Yes you can use chicken, beef, turkey, lamb etc. Just buy a regular cut then tenderise it with a tenderiser. Omg woman! You are sheer genius! So simple tho I would never had thought of it. Ah love ya! What an awesome comment to leave me 🙂 Simple and genius!